I had not intended to go as much as a week without a post, but the fall semester just started at MIT, which means work went from zero to sixty in about a half a second, tough to adjust to after a too-short summer. So, it seemed like a good time to reboot a couple of the simplest recipes from the beginning of the book. The New Joys of Jell-O does have a sort of progressive order to it, with the first chapter (“NIce, Easy Things to Do with Jell-O”) gently leading into Jell-O cookery with your basic fruits suspended in Jell-O and, of course, techniques like Cubed Gelatin. That’s probably why I didn’t make notes of the first dozen or so recipes I did when I first started the Project. I think I had originally set out to do them in the order in which they appear in the book, but changed my mind for reasons already discussed elsewhere in the blog. After an unseasonably cool August, last week saw the return of summer, so I made Melon Cooler. It doesn’t get much simpler than this. The most difficult part of the recipe was selecting the “citrus-based carbonated beverage”, both because I’m not a big fan of citrus-based carbonated beverages and because it’s not possible to buy a single twelve-ounce can, or even a six-pack of twelve-ounce cans, in the supermarket. We seldom have soda (or “tawnic” in the local vernacular) in the house, so it came as a bit of surprise to me that the cans in six-packs are now small, maybe eight ounces, like the ones they have on airplanes where the flight attendant doles out half the can into a plastic cup for you and you feel ripped off even though you’re not being charged extra for it. Twelve-ounce cans now come only in twelve-packs or cases. The most sensible choice available turned out to be in a display of bottled sodas from Mexico – a Fanta piña. The most time-consuming part of preparing this recipe was making the melon balls. Before I started this recipe, we didn’t actually have a melon baller, and it turned out to be a little tricky to find one. My theory is that melon balls have fallen out of fashion because, okay, it’s time-consuming to make them, but it’s also a really inefficient use of a melon. 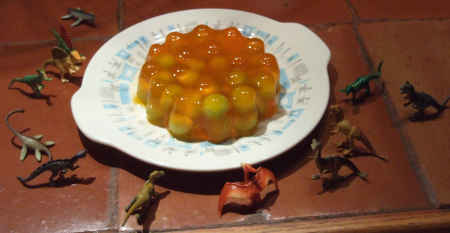 In fact, the recipe calls for the melon to be diced, but I thought melon balls would look more interesting in a Jell-O mold – and I was right. The odd pieces of melon that didn’t get balled were chopped up and I had honeydew bits for a breakfast for a couple of days, so all’s well that ends well. Melon Cooler did turn out to be a nice thing to eat on a hot summer evening. 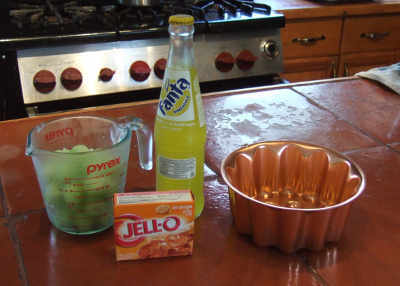 The honeydew helped to tone down the heavy sweetness of the orange Jell-O, making the dessert surprisingly refreshing. Unfortunately, the Fanta piña, tasty enough by itself, didn’t really hold its own in the Jell-O, leading Bryan to ask what was the point of it. I have no idea. However, we did at least eat all of it. Quick Fruit Dessert. One of these days I’m going to get the hang of centering a Jell-O mold on a plate…. Today’s Jell-O was even easier, Quick Fruit Dessert. I made a batch of Jell-O (mango flavored) to which I added a ten-ounce package of frozen fruit (store-brand organic raspberries). 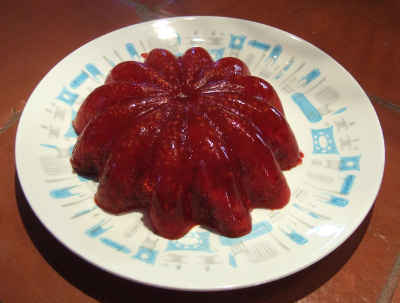 The recipe called for this to be served soft-set after chilling for an hour or so (hence “quick”) but I wanted more Jell-O mold practice, so it set up for several hours to be served as dessert after dinner. It was still quick, and I think we actually liked it. The berries definitely dominated. The mango flavor was noticeable, but subtle, and the whole was tart and refreshing.